It is amazing how dismissive young children can be of nostalgia. Mention old-fashioned stories and jobs of yester-year and the response (in our household anyway!) is usually – BORING! But brought to life in just the right way and you will capture their imagination and any thoughts of modern day technology goes out of the window, for a little while at least. Ruaridh (9) and Flora (6) are lucky enough to be experienced travellers for their ages and so sometimes it is hard to impress them. But after a weekend spent in The Lake District, they were hooked! Admittedly, they were initially enticed by the thoughts of seeing where the Swallows and Amazons film was shot and the prospect of staying in one of their favourite hotel chain’s top abodes, but once their attention was caught, it was easy to have fun as there is so much to do and see in this part of the world. Our base for the weekend was The Old Swan in Grasmere. Dating back to the 1650s, it was a former coaching inn, which was said to be a favourite for local boy and poet William Wordsworth when he was entertaining his chum and fellow writer Sir Walter Scott. The two were said to be frequent visitors to the drinking end of the inn and Wordsworth penned “The Waggoner’’ poem during a visit. Now owned by The Macdonald Hotel chain, it retains its old-fashioned style, but has all the modern amenities you could wish for. As you enter there is a historic post box and clock to admire as you are served by the well organised reception staff. The bedrooms are large and airy, with good sized beds, massive bathrooms and all the perks of modern life including Wi-Fi, satellite television and tea and coffee making facilities. The Waggoner’s restaurant is where breakfast and dinner are both served, with the former featuring home cooked dishes to get you going first thing and the latter, using local produce to create good solid cooking with a nice twist, the steaks being a particular favourite. The Old Swan sits proudly at the top of the entrance to the village of Grasmere and a short walk takes you into the centre, where you can see lots of picture postcard houses made from the famous Lake District stone, individual shops and restaurants and hotels and of course all things William Wordsworth, including his burial ground and a daffodil garden created in his honour, plus nearby, his former home, Dove Cottage. There is also Sarah Nelson’s famous gingerbread shop, which is lovely and tasty and plenty of walks to take in the scenery. Just down the road is the National Trust owned Ambleside Roman Fort , where you can wander around and pretend to be one of the commanders as you admire the neighbouring Lake Windermere. This grade one listed site shows the remains of a one impressive fort. And all that talk of water had Ruaridh and Flora discussing Arthur Ransome’s classic Swallows and Amazons, which told the tale of a family holiday in The Lake District in 1929 featuring sailing, piracy and great fun! While you are in a historical mind, a short drive to Newby Bridge will find you at the last remaining bobbin mill, which produced millions of the wooden wonders for the Lancashire spinning and weaving industries. Built in 1835, this wonderfully designed mill is brought back to life with an interactive tour which guides you through the whole bobbin making process. Who would have thought there were so many different sizes and uses for this versatile piece of wood! In its hey day, 250 boys and girls worked at the mill and produced a quarter of a million bobbins a week in some trying conditions, which I am not sure many youngsters of today would enjoy. Our last stop took us just over the border and to Carlisle Castle which stands proudly in the city it has dominated for nine centuries. It was a working fortress for many years and has withstood lots of sieges, held a valuable royal prisioner and been home to the King’s Own Royal Border Regiment. It’s great exploring such a place and allowing the children to roam free and pretend to be former inhabitants (on the winning side of course!). Next door is Cumbria’s Museum of Military Life, which has great displays and a chance to try your hand at the morse code, who said nostalgia was dead! 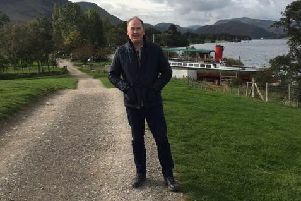 Accommodation: The Lake District boasts some wonderful hotels and one of the oldest is The Swan Hotel in Grasmere, an old coaching house which dates back to 1650 and was mentioned in William Wordsworth’s The Waggoner poem. Famous guests include writer Sir Walter Scott. Today all the old-fashioned charm is complemented by up market bedrooms, slick service and good food. Run by The Macdonald Hotel chain, there is even a room with a four poster bed! Check out www.macdonaldhotels.co.uk for latest offers. Books: Swallows and Amazons by Arthur Ransome is back on the book shelves following the release of the film. For more information, log onto www.penguin.co.uk/vintage or www.audible.co.uk for the audio version.